A single error made eons ago has been the cause of every conceivable problem mankind has had in the past and the present. This error resulted in mankind separating himself from God and creating the ego (lower self mind) to replace God. Join Deborah and Robert as they reveal many truths that are not commonly taught by our educational and religious institutions. Today’s Divine Family addresses many of these truths along with the main concepts of A Course In Miracles (ACIM). By learning these truths and practicing the ACIM concepts you can heal your mind and body of all guilt, fear and unhappiness and replace it with peace and love.' You can Buy the Book here now. A MIRACLE, as the name implies, is of a divine source. A miracle is a healing of the mind and body performed by Holy Spirit, which is an expression of God’s love for us. The miracles performed by Holy Spirit are true miracles, as the healings that occur within you would not have happened otherwise. Everyone is entitled to miracles. Miracles have nothing to do with the laws of this world, but are God’s laws. When we bring a negative thought, belief, or concern to Holy Spirit for healing, the healing is instant in most cases. When a miracle occurs, our former problem quickly becomes a vague memory, and later we find we have little or no recollection of it; it’s as if it had never existed. The problem had never really existed because it was part of our dream to begin with. Today's Divine Family is for the spiritually mature reader who is prepared to ascend into the fourth and fifth dimensions. This book encompasses the primary concepts and principals of A Course in Miracles, as well as the spiritual experiences and shared conversations with Jesus. Through a series of past-life regressions and trance channellings, Bob and Deborah discovered they were members of Jesus' family over 2,000 years ago. Deborah was called Miriamne, and Bob was Jesus' brother James. They were close to Jesus and His teachings and members of that Divine Family; thus, Today's Divine Family became the title for this book. 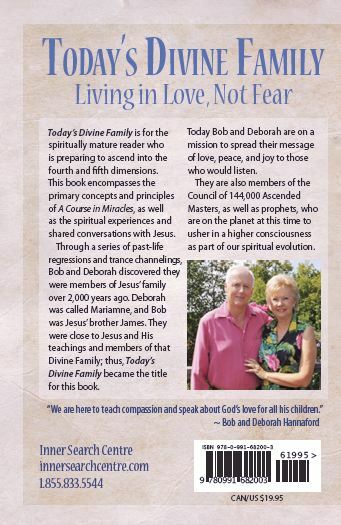 Today Bob and Deborah are on a mission to spread their message of love, peace, and joy to those who would listen. They are also members of the Council of 144,000 Ascended Masters, as well as prophets, who are on the planet at this time to usher in a higher consciousness as part of our spiritual evolution. "We are here to teach compassion and speak about God's love for all his children." " Again, Deborah shines with her patience & knowledge." Re: module 114, The Transforming Power of Trust. "I acknowledge your wisdom, your compassion & your depth of commitment, Deborah."